I suppose this is the “real” beginning of the gardening season then. 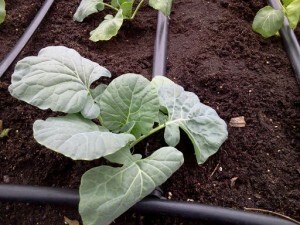 I got the first plants into the garden proper, the broccoli, Brussel’s sprouts, and the cabbages. I came up one cabbage short due to losing so many seedlings to damping off, but everything else came out just right with no leftovers. That can be a good thing, there’s no waste; or a bad thing, if I lose any of the plants there’s nothing to replace them with unless I buy some at a garden center. I didn’t do a whole lot to prep the bed; when push comes to shove at this point they really don’t need much. I spread 4 bags of mushroom compost over the top, and mixed in some 10-10-10. I thought about putting in organic fertilizer, but it has blood meal as one of its components I believe and I do not want critters digging up my freshly planted brassicas. They might do it anyway of course, but there’s no sense in asking for trouble. 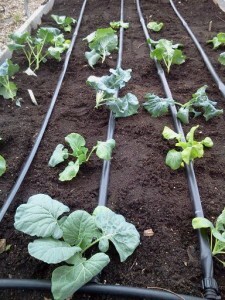 Although the t-tape drip irrigation system is down, as wet as it’s been the last couple of months, it’ll be some time before there’s any necessity for additional watering, especially in these raised beds which are really glorified potting soil that hold the moisture quite well. A for instance is the thyme which I planted last year and which did not do very well. Come to find out it actually prefers things a bit drier so that I think it was just too damp for it getting watered every day. 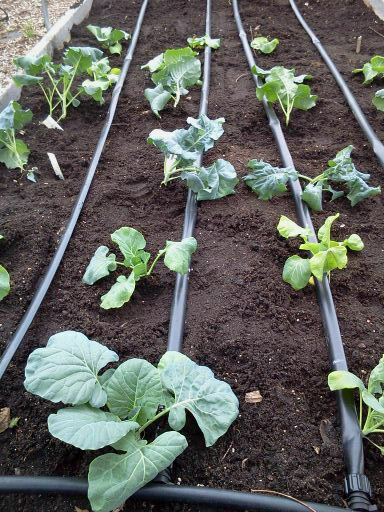 This year I may leave the herb bed drip irrigation cut off and just water the individual plants so that I can tailor the watering needs to the individual plants rather than using a blanket method. We’ve gotten notification from Stark Bros that the peach trees have shipped. There are three holes dug, only three more to do, and the trees can just be popped in the ground. So that will be done by this time next week I hope. Been tinkering a bit with the theme. Going to take a bit of tinkering to get it like I want it really, especially since it’s a “learn as you go” type of a situation. I think I actually liked Twenty Ten better than Twenty Eleven but just the basic theme will do for now. 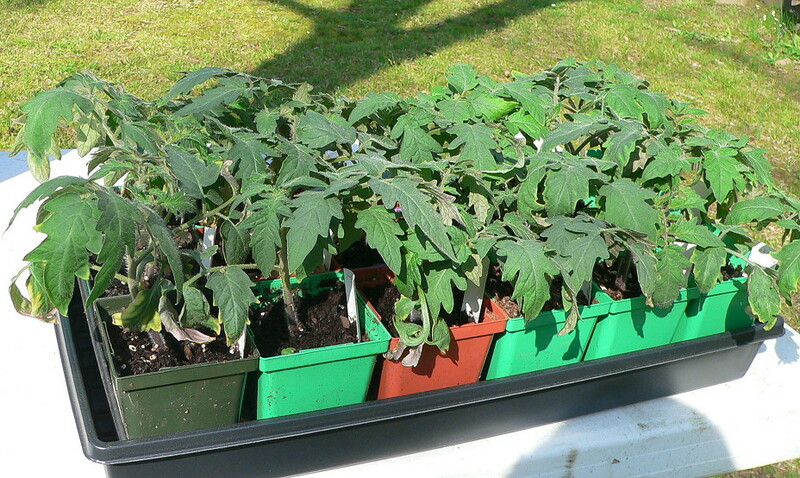 It’s hard to believe these tomato babies are a whole six weeks old now. Or maybe not so hard, they’re certainly doing well. Had a brief scare when they started yellowing early on (and you can see a bit of that in the photo) but although at the time I thought I may have been overwatering them, now I’m more inclined to believe that they had simply outstripped their nutrients. Shortly after that I started watering about every other time with a half-strength fertilizer solution and saw no more yellow. Actually I’m to the point where I have to harden them off, they’ve gotten so tall that there’s quite a size difference between them and a lot of the other starts (basil, parsley, lettuce, etc.) and I’m having to put the shorter plants up on an upside down flat to raise them up closer to the lights. There’s no cold weather in the forecast for at least the next week, maybe even to the end of the month. 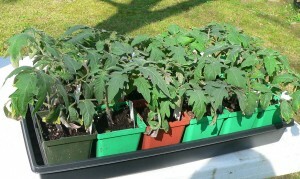 It’s very possible I’ll be planting these babies in the next few days.